Representative Tulsi Gabbard of Hawaii has announced that she will run for U.S. president in 2020. An Army National Guard veteran, Gabbard was first elected to the House of Representatives in 2012. She is the first Hindu ever elected to Congress; and one of the first two female combat veterans ever to serve in Congress. She will be 39 on Inauguration Day in 2021, which if elected would make her the youngest president in American history. 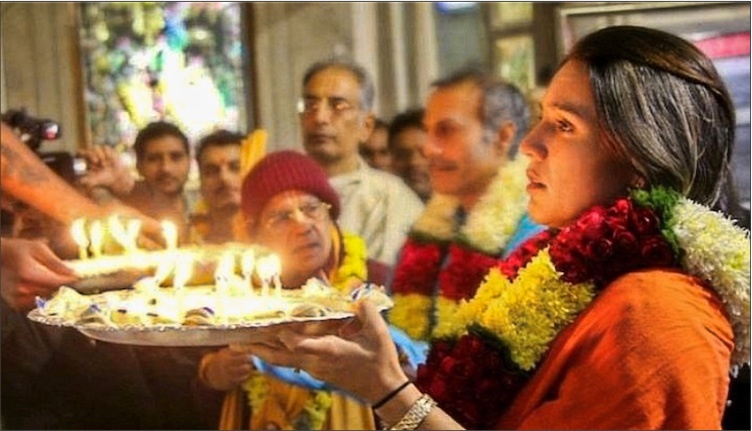 Tulsi Gabbard describes herself as a “Vaishnava Hindu” and is a devotee of Lord Krishna. In 2013, she was the first Congresswoman to swear in using the Bhagavad-gita. Tulsi Gabbard again took her oath of office on the Bhagavad-gita in 2017 while being re-elected to the U.S. House of Representatives. During her annual holiday greetings for Janmashtami and Diwali, she often mentions the importance of spiritual values. And in her Janmashatami 2018 address, she said, “The Supreme Lord, Sri Krishna is the reservoir of all happiness. So if we want to be happy, we need to be connected with Him. And he gives us so many ways to do this. By hearing His instructions through scripture, we can be connected with Him. By hearing of His pastimes when He appeared in this world some 5000 years ago, we can be connected with Him. By hearing and glorifying any of His countless names, we can be connected with Him. And by engaging our time, energy, and skills in the loving service of God and all His children, we can be connected with Him. On September 13th, 2016, Congresswoman Tulsi Gabbard attended the ISKCON 50thAnniversary Gala Event in Washington D.C., along with many other vips including government representatives, political leaders, religious leaders, and academics. As the Keynote Speaker for the evening, Gabbard spoke of her personal appreciation for ISKCON’s Founder-Acharya Srila Prabhupada, 19thCentury Vaishnava teacher Srila Bhaktivinode Thakur, and the teachings of 19thCentury saint and avatra Sri Chaitanya Mahaprabhu. Quoting Mahaprabhu’s Siksastakam prayers, she said that Vaishnavism is not sectarian, but that it appreciates the religious sentiment and expression of all people. She also offered her gratitude to Srila Prabhupada for bringing the Vaishnava tradition from India to the West and then all over the world. Inspired by these convictions, Gabbard has promised to be a leader who puts service toothers as her priority, whether she remains a member of Congress, or someday occupies the White House.